So I was planning on doing this a little different. When I went to the fabric store this morning I had a cute idea in my head for a Christmas tree because I had some green stripped fabric at home. When I got home I realized that my cute stripped fabric was blue and not green. Shoot! So I had to work with what I had. 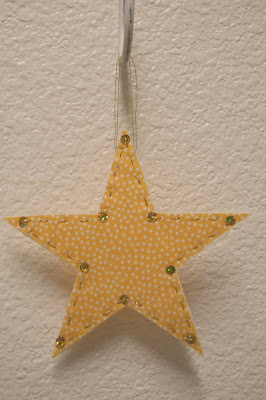 The star is not my favorite but I had yellow fabric. I threw it together really fast so it's not the cutest. However it will work. And I forgot a materials photo. Sorry! 1. Peel paper off one side of fusible webbing and stick to wrong side of fabric (I only had a jagged scrap but as long as it fits your design it doesn't matter!). Leave the other paper backing on for now. Iron onto fabric. 2. Trace pattern onto paper/fabric combo. 3. Cut out design. Then repeat. You will need two of whatever design you choose. 4. Choose one to be your front and one to be the back. Take the front, peel the second paper backing off and stick to felt. Iron on and cut out. If you want to add any embellishments (embroidery, sequins, beads, buttons, ect.) do it now. 5. Take the back side of your ornament and peel off the second paper backing. Align onto the back. Before you iron add your hanger. Loop string, ribbon, twine, whatever you like so that the ends are between felt and the sticky side of your back. Iron on. Your done! Photo at the top of page! I'm going to give away a set of these ornaments in the shape of Christmas Trees! How many are in a set you ask? Three! So leave a comment on this post by Sunday! I'll announce the winner sometime on Monday! Check back then! Enjoy! I love these! You are so crafty. Cute idea Bailey! Count me in for the give away! You never fail to come up with cute stuff! I'm always up for a give away, especially around the holidays. Very simple. Very nice. Keep up the tutorials! Oh, and it goes without saying to include me in the give-away (even though I just said it).